Space warfare is combat that takes place in outer space, i.e. outside an atmosphere. Space warfare therefore includes ground-to-space warfare, such as attacking satellites from the Earth, as well as space-to-space warfare, such as satellites attacking satellites. It does not include the use of satellites for espionage, surveillance, or military communications. It does not technically include space-to-ground warfare, where orbital objects attack ground, sea or air targets directly, but the public and media frequently use the term to include any conflict which includes space as a theater of operations, regardless of the intended target. For example, one might describe a rapid-delivery system in which troops are deployed from orbit as "space warfare", even though the US military uses the term as described above. In the early 1960s the U.S. military produced a film called Space and National Security which depicted space warfare. From 1985 to 2002 there was a United States Space Command, which in 2002 merged with the United States Strategic Command. The Russian Space Force, established on August 10, 1992, which became an independent section of the Russian military on June 1, 2001, was ultimately replaced by the Russian Aerospace Defence Forces starting December 1, 2011. Only a few incidents of space warfare have occurred in world history, and all involved training missions, as opposed to actions against real opposing forces. 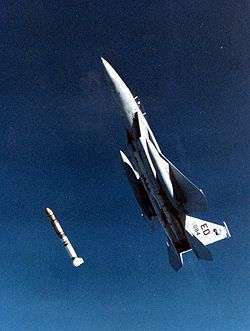 In the mid-1980s a USAF pilot in an F-15 successfully shot down the P78-1, a communications satellite in a 345-mile (555 km) orbit. In 2007 China used a missile system to destroy one of its obsolete satellites (see 2007 Chinese anti-satellite missile test), and in 2008 the United States similarly destroyed its malfunctioning satellite USA-193. As of 2016 there have been no human casualties resulting from conflict in space. Early efforts to conduct space warfare were directed at space-to-space warfare, as ground-to-space systems were considered to be too slow and too isolated by Earth's atmosphere and gravity to be effective. The history of active space warfare development goes back to the 1960s when the Soviet Union began the Almaz project, a project designed to give them the ability to do on-orbit inspections of satellites and destroy them if needed. Similar planning in the United States took the form of the Blue Gemini project, which consisted of modified Gemini capsules that would be able to deploy weapons and perform surveillance. Through the 1970s, the Soviet Union continued their project and test-fired a cannon to test space station defense. This was considered too dangerous to do with a crew on board, however, so the test was conducted after the crew had returned to Earth. Space warfare strongly influenced the final design of the United States Space Shuttle. The distinctive delta wing shape was needed if the shuttle were to launch a military payload towards the Soviet Union and perform an immediate de-orbit after one rotation to avoid being shot down. Both the Soviets and the United States developed anti-satellite weaponry designed to shoot down satellites. While early efforts paralleled other space-to-space warfare concepts, the United States was able in the 1980s to develop ground-to-space laser anti-satellite weapons. None of these systems are known to be active today; however, a less powerful civilian version of the ground-to-space laser system is commonly used in the astronomical technique of adaptive optics. 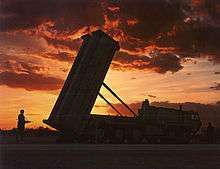 The People's Republic of China successfully tested a ballistic missile-launched anti-satellite weapon on January 11, 2007. This resulted in harsh criticism from the United States of America, Britain, and Japan. See 2007 Chinese anti-satellite missile test. The U.S. developed an interceptor missile, the SM-3, testing it by hitting ballistic test targets while they were in space. On February 21, 2008, the U.S. used a SM-3 missile to destroy a spy satellite, USA-193, while it was 247 kilometers (133 nautical miles) above the Pacific Ocean. Japan fields the U.S.-made SM-3 missile, and there have been plans to base the land-based version in Romania and Vietnam. In the late 1970s and through the 1980s the Soviet Union and the United States theorized, designed and in some cases tested a variety of weaponry designed for warfare in outer space. 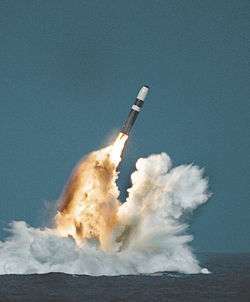 Space warfare was seen primarily as an extension of nuclear warfare, and so many theoretical systems were based around the destruction or defense of ground and sea-based missiles. Space-based missiles were not attempted due to the Outer Space Treaty, which banned the use, testing or storage of nuclear weapons outside the Earth's atmosphere. Systems proposed ranged from measures as simple as ground and space-based anti-missiles to railguns, space based lasers, orbital mines and similar weaponry. Deployment of these systems was seriously considered in the mid-1980s under the banner of the Strategic Defense Initiative (popularly known as Star Wars). If the Cold War had continued, many of these systems could potentially have seen deployment: the United States developed working railguns, and a laser that could destroy missiles at range, though the power requirements, range, and firing cycles of both were impractical. With the end of the Cold War and continued development of satellite and electronics technology, attention was focused on space as a supporting theatre for conventional warfare. Currently, military operations in space primarily concern either the vast tactical advantages of satellite-based surveillance, communications, and positioning systems or mechanisms used to deprive an opponent of said tactical advantages. Accordingly, most space-borne proposals which would traditionally be considered "weapons" (a communications or reconnaissance satellite may be useful in warfare but isn't generally classified as a weapon) are designed to jam, sabotage, and outright destroy enemy satellites, and conversely to protect friendly satellites against such attacks. To this end, the US (and presumably other countries) is researching groups of small, highly mobile satellites called "microsats" (about the size of a refrigerator) and "picosats" (approximately 1 cubic foot (≈27 litres) in volume) nimble enough to maneuver around and interact with other orbiting objects to repair, sabotage, hijack, or simply collide with them. Another theorized use involves the extension of conventional weaponry into orbit for deployment against ground targets. Though international treaties ban the deployment of nuclear missiles outside the atmosphere, other categories of weapons are largely unregulated. Traditional ground-based weapons are generally not useful in orbital environments, and few if any would survive re-entry even if they were, but as early as the 1950s, the United States has toyed with kinetic bombardment, i.e. orbiting magazines of non-explosive projectiles to be dropped onto hardened targets from low-earth orbit. Kinetic weapons have always been widespread in conventional warfare—bullets, arrows, swords, clubs, etc.—but the energy a projectile would gain while falling from orbit would make such a weapon rival all but the most powerful explosives. A direct hit would presumably destroy all but the most hardened targets without the need for nuclear weapons. Such a system would involve a 'spotter' satellite, which would identify targets from orbit with high-power sensors, and a nearby 'magazine' satellite to de-orbit a long, needle-like tungsten dart onto it with a small rocket motor or just dropping a very big rock from orbit (such as an asteroid). This would be more useful against a larger but less hardened target (such as a city). Though a common device in science fiction, there is no publicly available evidence that any such systems have actually been deployed by any nation. 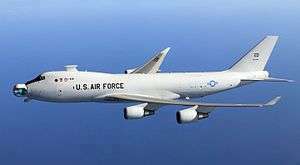 A USAF Boeing YAL-1 airborne laser. Weapon systems that fall under this category include lasers, linear particle accelerators or particle-beam based weaponry, microwaves and plasma-based weaponry. Particle beams involve the acceleration of charged or neutral particles in a stream towards a target at extremely high velocities, the impact of which creates a reaction causing immense damage. Most of these weapons are theoretical or impractical to implement currently, aside from lasers which are starting to be used in terrestrial warfare. That said, directed-energy weapons are more practical and more effective in a vacuum (i.e. space) than in the Earth's atmosphere, as in the atmosphere the particles of air interfere with and disperse the directed energy. Space warfare is likely to be conducted at far greater distances and speeds than terrestrial combat. The vast distances involved pose difficult challenges for targeting and tracking, as even light requires a few seconds to traverse ranges measured in hundreds of thousands of kilometers. For example, if attempting to fire upon a target at the distance of the Moon from the Earth, the image one sees reflects the position of the target slightly more than a second earlier. A projectile from a railgun recently tested by the US Navy would take over eighteen hours to cross that distance (making the simplifying and optimistic assumption that it will travel in a straight line at a constant velocity of 5.8 km/s along its entire trajectory). Even a laser will need approximately 1.28 seconds, meaning a laser-based weapon system would need to lead a target's apparent position by 1.28×2 = 2.56 seconds. Three factors conspire to make engaging targets in space very difficult. First, the vast distances involved mean that an error of even a fraction of a degree in the firing solution could result in a miss by thousands of kilometers. Second, space travel involves tremendous speeds by terrestrial standards—a geostationary satellite moves at a speed of 3.07 km/s whereas objects in low earth orbit can move at up to 8 km/s. Third, though distances are large, targets remain relatively small. The International Space Station, currently the largest artificial object in Earth orbit, measures slightly over 100m at its largest span. Other satellites can be orders of magnitude smaller, e.g. Quickbird measures a mere 3.04m. External ballistics for stationary terrestrial targets is enormously complicated—some of the earliest analog computers were used to calculate firing solutions for naval artillery, as the problems were already beyond manual solutions in any reasonable time—and the issues in targeting objects in space make a difficult problem even harder. Additionally, though not a problem for orbital kinetic weapons, any directed energy weapon would require large amounts of electricity. So far the most practical batteries are lithium batteries, and the most practical method of generating electricity in space is through photovoltaic modules, which are currently only up to 30% efficient, and fuel cells, which have limited fuel. Current technology might not be practical for powering effective lasers, particle beams, and railguns in space. Regardless of one's reasons for going to war, at present those reasons are not likely to suggest major targets located in space. Most of the main theories which attempt to explain human proclivity for warfare—psychological, sociological, demographic, economic, political, or otherwise—would not indicate space as a likely location of conflict until a significant population is engaged in large-scale activity there. Until then, space warfare is likely to take a supporting role to conventional, terrestrial warfare. Aside from applications such as communications, reconnaissance, GPS, and the like, which would be difficult or impossible without satellites, there do not appear to be any major advantages to basing weapons systems in space. The main reason is simply cost. Space warfare that involves humans being deployed in space to fight each other is not currently practical because of the difficulty and cost of sustaining human life in space, especially over long periods of time. Additionally, there are few things that could be accomplished by space warfare that any nation wealthy enough to finance them cannot accomplish far more cheaply through conventional means. Raising any significant mass beyond Earth's gravity will always require a large amount of energy, and the cost increases with mass. 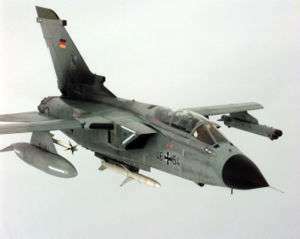 For example, though kinetic bombardment potentially offers the ability to strike any target anywhere in the world within minutes, both the United States and Russia, possibly the only nations with the resources and facilities necessary to implement such a system, have sufficiently long-range supersonic bombers that the same target could already be destroyed in a matter of hours at a mere fraction of the cost. Anti-satellite attacks, especially ones involving kinetic kill vehicles, can contribute to the formation of space debris which can remain in orbit for many years and could interfere with future space activity or in a worst case trigger a Kessler Syndrome. The PRC is reported to be developing "soft-kill" techniques such as jamming and vision kills that do not generate much debris. General William L. Shelton has said that in order to protect against attacks, Space Situational Awareness is much more important than additional hardening or armoring of satellites. The Air Force Space Command has indicated that their defensive focus will be on "Disaggregated Space Architectures". Most of the world's communications systems rely heavily on the presence of satellites in orbit around Earth. Protecting these assets might seriously motivate nations dependent upon them to consider deploying more space-based weaponry, especially in conflicts involving advanced countries with access to space. Even without the further militarization of space, a future conflict conducted largely on the ground through conventional means might well be sparked by actions conducted entirely in space. Alternatively, the very threat of space warfare may be enough to put considerable pressure on the political system of a nation, such as the pressure which caused the formation of the Outer Space Treaty. Space warfare is a topic often touched upon in science fiction, with a wide range of realism and plausibility, from stories based on anticipated future technology and tactics, to fantasy or historically based scenarios that happen to take place in a science-fiction background. Some portray a space-borne military will be similar to an Air Force, whereas others depict a more naval analog. Still others suggest forces more like marines: highly mobile forces engaged in interplanetary and interstellar warfare but with most of the actual conflict occurring in terrestrial environments. Both kinetic energy and directed energy weapons are often portrayed, along with various military space vessels. The Lensman series by E. E. Smith is an early example, which also inspired the term Space Opera due to the grandiose scales of the stories. The Ender's Game series by Orson Scott Card is a notable example in that it makes conjecture as to what sort of tactics and training would be required for war in outer space. Other science fiction authors have also delved into the tactics of space combat, such as David Weber in his Honorverse series as well as Larry Niven and Jerry Pournelle in their Mote in God's Eye series. A more recent example would be Alastair Reynolds' Revelation Space universe, which explores combat at relativistic speeds. Robert A. Heinlein's Starship Troopers is perhaps one of the best-known and earliest explorations of the "space marine" idea. Space-based vehicular combat is portrayed in many movies and video games, most notably Star Wars, the Halo series, Descent, Gundam, Macross, Babylon 5, and Star Trek. Games such as the Homeworld series provide interesting concepts for space warfare, such as game mechanics using three-dimensional battle formations, the use of plasma-based projectors that receive their energy from a ships propulsion system, and automated unmanned space combat vehicles. Other series, such as Gundam, prominently feature vehicular combat in and among many near future concepts, such as O'Neill cylinders. The distinct fictional settings in which space warfare occurs are far too numerous to list, but popular examples include Star Trek (in all of its various incarnations), Star Wars, Halo, Stargate, Warhammer 40,000, Babylon 5, Buck Rogers, Flash Gordon, Battlestar Galactica, Mass Effect, Freespace and many comic book franchises. Video games have frequently touched the subject, with the Wing Commander franchise serving as a prototypical example. Note that very few games attempt to simulate an environment with realistic distances and speeds, though Independence War and Frontier: Elite II both do, as does the board game Attack Vector: Tactical. ↑ PBS Nova Program "Astrospies" , Broadcast February 12, 2008. ↑ Draper, Alfred C.; Buck, Melvin L.; and Goesch, William H. "A Delta Shuttle Orbiter." Astronautics & Aeronautics. 9 (January 1971): 26-35. ↑ "Satellite Shoot Down: How It Will Work". Space.com. February 19, 2008. Retrieved 2008-02-21. 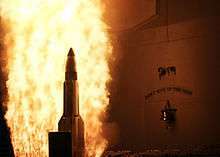 ↑ "Navy Hits Satellite With Heat-Seeking Missile". Space.com. February 21, 2008. Retrieved 2008-02-21. ↑ "DoD Succeeds In Intercepting Non-Functioning Satellite (Release No. 0139-08)" (Press release). U.S. Department of Defense. February 20, 2008. Retrieved 2008-02-20. ↑ "Navy Succeeds In Intercepting Non-Functioning Satellite (Release NNS080220-19)" (Press release). U.S. Navy. February 20, 2008. Retrieved 2008-02-20. ↑ "photovoltaics". Spectrolab. Spectrolab, Inc. 2009. Retrieved 4 April 2014. ↑ Covault, Craig (January 21, 2007). "China's Asat Test Will Intensify U.S.-Chinese Faceoff in Space". Aviation Week. Archived from the original on 27 January 2007. Retrieved January 21, 2007. ↑ Grady, John (29 January 2014). "U.S. Dependence on Space Assets Could be a Liability in a Conflict with China". usni.org. U.S. NAVAL INSTITUTE. Retrieved 29 January 2014. ↑ "Future of USAF Space Command." Defense News, 30 September 2012. ↑ "The Future of our Space Architecture." John J. Klein: Space Warfare: Strategy, Principles and Policy. Routledge, Oxford 2006, ISBN 978-0-415-40796-0.